Kevin Hopkins, Ph.D. UH Hilo Professor of Aquaculture, is the Director of the Pacific Aquaculture and Coastal Resources Center (PACRC) leading innovative programs of research, education and extension services. 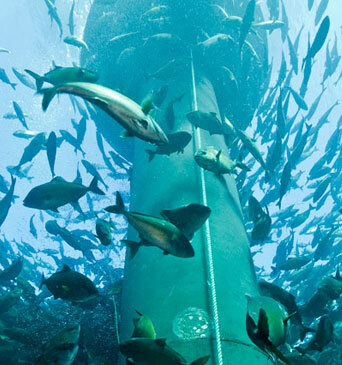 PACRC is the University of Hawaii Sea Grant College Program’s Center of Excellence in Sustainable Aquaculture. New technologies have resulted in considerable expansion of Hawaii’s fledging aquaculture industry over the past decade. Most of Hawaii Island’s commercial mariculture ventures are tenants at the Natural Energy Laboratory of Hawaii Authority (NELHA) in Kona. Anchored since 1959 by the prestigious Hawaiian International Billfish Tournament (HIBT), the island enjoys a legendary reputation for sportfishing. Honokohau Small Boat Harbor houses Kona’s charter fishing fleet with 262 moorings, three ramps, fuel facility and restaurants. A smaller number of charter boats and commercial vessels are also housed in Hilo at Reed’s Bay and the Wailoa Sampan Basin and Boat Harbor, and in Kawaihae at the Kawaihae Small Boat Harbor.